Well, it’s been awhile since I’ve posted a renovation update. Things have been going on, but not much that is all that impressive with photos. We’ve had electrical work going on. The new water and propane lines have been trenched in. New ductwork is in progress. New electrical and phone service will be trenched in this week or next. 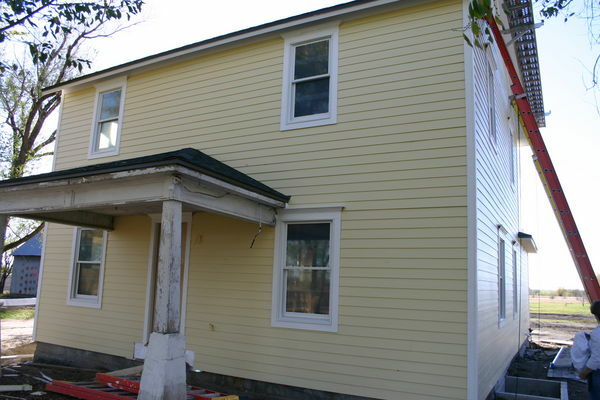 In the past week, the new siding has started going up, and the sheetrock is supposed to start going up on Monday. So there is some quite visible change going on now! Click here for the pictures. Both Jacob and the house are shaping up pretty good! I think Jacob is looking like you in the wedding picture. Your house resembles our farm house when we were growing up. Ours had a screen porch instead of the kitchen & breakfast on yours. And yours must be twice as big as our four-roomer. The house is looking great but I have 2 questions. Do they use motorized louvers for zone heating?? And did you notice they slipped a cardboard box in above the plentum?? You should ask them to at least spray paint it silver. I’ll make sure to mention the cardboard to the painter. I bet they can jazz it up. You’re exactly right about the louvers. It should help save us money down the road.